So check it out, remember the top handle rig I talked about? Well using the same parts you can mount any follow focus with a 1/4 inch mounting point to your Magic Arm! Check out the video to see how I did this with my D|Focus. 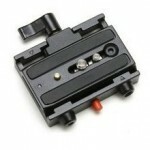 Not as many mounting options as the cinevate baseplate, but it is a fraction of the price. 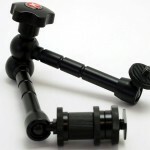 Get a couple if you can so you can use the same baseplate on multiple rigs, tripods etc. These are great. There are so many uses for these arms so if you every switch up your rigging you will always have a use for one of these. Wow another great idea Caleb! I am going to have to try this. Nice. These friction arms just keep finding new uses. Question though – how useful is a follow focus when you are shooting without an assistant to pull focus? My understanding is that the real use for these is measured, repeatable focus pulls for controlled shooting -like where actors are hitting pre-determined marks in a blocked scene. Even then, you can use gaf tape on the lens with focus points marked and have an assistant pull focus off the lens. So what do people use these for when they shoot run and gun? I’ve never understood this and figured I’m missing something because everyone is running around with these things (and matte boxes for that matter) and don’t seem to be using them in the intended way. Please fill me in. Your right. They are really designed for an AC to use along side the operator. I can’t speak for everyone but there is something so brainlessly easy about using a FF on sticks (w/HD monitor and full HD feed from the cam). Just like the little FF units on fixed broadcast cams. But when I am on a monopod or handheld the FF just gets in the way to me. Caleb, great idea. I’m relatively new to the dslr video scene and don’t have a huge budget. This is the kind of stuff people like me need! I shoot video for work projects in some very difficult situations (mostly very high light, like close ups of live arc welding). I just picked up a variable nd filter. Do you have any other suggestions? You can see what I shoot here: http://youtu.be/IBg84md1Ut0?hd=1 the actual welding starts about 1/2 way through. Very clever! I like it, small and compact, less intimidated. Where can I get the follow focus? Seem expensive. what version is your D focus? Which version of the d-focus is used? I believe the company updated the dfocus and it may not work. I may be completely wrong.